Here’s a provocative question: Is this generation of daughters their fathers’ new sons? That was my takeaway from a book called Our Fathers, Ourselves, by Dr. Peggy Drexler. The book tracks over 120 hours of interviews with women of all ages, backgrounds and ethnicities within the United States. Drexler, who lost her own father at the age of three, investigated how fathers in this generation of women and recalibrated their expectations to be more in line with what they hoped for their sons. Sifting through reams of well-worn truths—e.g., a father is the first man in his daughter’s life—three recurring parenting lessons shine through from the women interviewed for the book. Many of the women said that they learned perseverance from their fathers. Their dads didn’t let them give up easily whether it was learning to ride a bicycle or finishing a thesis. Fathers and daughters who regularly engaged in conversation and did things together whether it was playing tennis, grilling burgers or going to the movies had good self-esteem. Education goes hand-in-hand with self-esteem. The fathers that encouraged their daughters to get an education were the same ones who held their daughters in high regard. I like reading stories about relationships and that’s what initially drew me to Drexler’s book. But the book that really hooked me was an anthology compiled from essays originally recorded for the radio series, This I Believe: On Fatherhood. Thought not the most polished pieces of prose in print, these essays were intended to be spoken. When I read some of them out loud I clearly heard simplicity, truth and emotion. Many essays talked about hard working dads who left their children lasting gifts of character and strength. One of my favorite pieces talked about a stern father who wasn’t shy about taking a belt to his son’s bottom. One day the boy accidentally burned down the family’s garage. Instead of spanking his son, his father gave him five dollars—a princely sum in the 1940s. This father told his son that he was more important to him than money, than a garage or anything else material in this world. While I recognized aspects of myself in Drexler’s interviews, it’s the “This I Believe” format where I met other people’s dads and got reacquainted with my own father. My dad was the only father among my peer group who served in the Second World War. I was the only eight year-old around who could quote Dad’s hero, Winston Churchill. The father of my childhood both intimidated and fascinated me. I’d look at my reflection in his General MacArthur aviator sunglasses and feel every bit the little girl that I was. He did one-armed pushups in the morning. He ate the same breakfast every weekday morning—half a grapefruit, a bowl of Special K and a cup of Sanka poured into the same mustard-colored mug with the white rim. I loved his collection of colored pens with which he wrote checks that looked like the flag of another country—the date in red, the payee in blue, the signature in green. I especially loved the elegant check registry, as large as a coffee table book, the brown leather embossed with K. Harold Bolton. I loved the crisp Ticonderoga pencils he used to print grocery lists on the cardboard that came with his laundered shirts. His small D’s looked like upside-down pennants. The items on his lists rarely varied—a low-calorie cottage cheese, ice milk instead of ice cream, wax paper instead of saran wrap. He set out vitamins for me every morning that included a concentrated tart chalky tablet of Vitamin C called Acerola. Our breakfast cereals had stern names like Product 19, Special K, or if Dad was in a light-hearted mood, Total. Nothing in our house glistened with sugar. Quite unexpectedly my father and I became close friends. In my mid-20s, he and I saw each other often even though he still lived in Hartford and I was in New York. He was retired by then and came into Manhattan by train. He always dressed in a suit to visit me and he treated my friends and me to beers. When I was nursing a bad break-up, I’d come home on weekends and we’d go to the bar across from the train station. “Anything we say or drink here is just between us,” he said smiling. I noticed for the first time how much he looked like his own father. He peppered his sentences with words like shan’t. I took days off to scour classical record shops with him and search for Cole Porter sheet music for the lyrics we both loved. Perseverance, self-esteem, education. Check, check, check. Thank you, Dad. But most importantly, by the end of his life, Dad and I believed in each other as father and daughter. 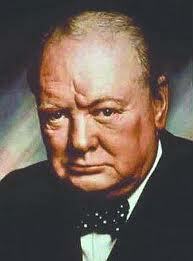 Dad’s hero, Churchill, once said that although he was half-American he felt wholly British. I know what he meant. There are moments in my life when I have felt so completely K. Harold Bolton’s daughter. This entry was posted in books, culture, family life by judy bolton-fasman. Bookmark the permalink.